This post will explain the concepts of a workflow and describe the separate components within the Oracle Workflow module. A workflow consists of numerous processes. Workflow processes represent business process flows and information routing. Oracle Workflow defines process rules. Each workflow process contains a set of activities, which can be notifications, PL/SQL stored procedures, or another sub process. The flow of business processes is less efficient when the information is not routed to the appropriate person(s) or group. The two needs are interdependent. The flow of business processes in Oracle Workflow can have decision points (branches), parallel flows, and loops. A decision point (branch) is where a decision must be made. Various flow options result from choices made at the decision point. Parallel flows are business processes that flow simultaneously. You can decide whether one, some, or all parallel flows must be completed before moving on to the next step. Loops are business processes that flow back to an activity completed earlier. In the past, information routing was performed primarily on paper. Now, information routing is usually performed through electronic messaging—emails. Electronic messaging is much more efficient, especially if your business process flow includes external organizations or personnel. For example, utilizing email, you can alert relevant parties that a decision needs to be made. You can also notify users when there are current or potential problems, and you can use notifications to solicit responses. 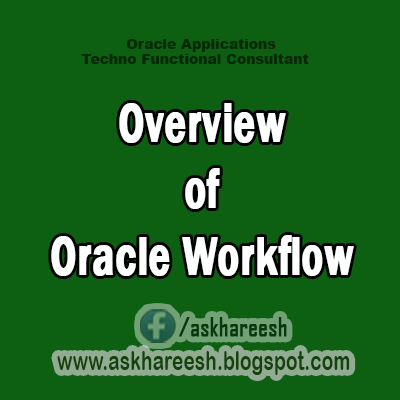 Oracle Workflow drives items or transactions of specific types through workflow processes. If, for example, you use the purchase order approval workflow process, the item type would be the purchase order. Purchase orders of one item type will comprise one specific purchase order. All items that have the same item type share the same set of attributes. Attributes consist of item-type data. Each item will have its own set of attribute values. In this purchase order example, attributes can be the purchase order number and supplier; values can be PO-12345 and ABC Supplier. The workflow process encompasses the entire process, from purchase order creation to completion. A completed purchase order can be approved, rejected, or cancelled. Oracle Workflow makes sure that the created purchase order is routed to the appropriate person(s) for approval and that the correct procedures are followed throughout the entire workflow process.